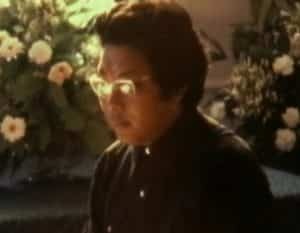 This is an account of Chogyam Trungpa Rinpoche’s early years in Colorado. It is based on interviews with people who were involved with his initial arrival and settling in Colorado and students who were in the initial group, such as myself. It was for me a highly poignant process interviewing people I hadn’t seen since the 1970s, as well as people I had become close with and continued to be close with as fellow students of Trungpa Rinpoche. It was also a timely task, as many of those people from the early days of Trungpa Rinpoche in the West are already gone, and the memories of those of us still living needed to be probed before the mists of aging memory move in. And of course there were somewhat different memories and accounts from different people which needed to be collated. The accounts of Trungpa Rinpoche in the interviews are varied, some devotedly positive, and some who did not take to Rinpoche’s style. But I met with none who denied the seminal influence of Trungpa Rinpoche in bringing Tibetan Buddhism to the West, or the brilliance of his teachings. 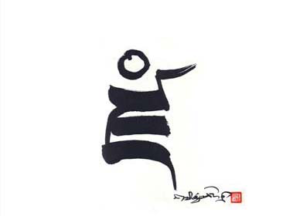 Appraising Trungpa Rinpoche is like the fabled seven blind men describing an elephant, each with a decidedly different version depending on which part of the elephant each was feeling. He was perceived and experienced in myriad ways, and he himself was highly diverse in his many expressions of character, pursuits, and talents. John Visvader and Karl Usow, University of Colorado professors in the Departments of Philosophy and Math respectively, initiated the idea to invite Trungpa Rinpoche to come to Colorado, then enlisted the support of fellow CU faculty and CU students. They sent an invitation to Trungpa Rinpoche at Samye Ling in Scotland, featuring a postcard of the Rocky Mountains and suggesting he might appreciate the similarity of Colorado to the mountains of Tibet. Meanwhile, Judy Hurley and members of the Zen group, as well as a few others in the CU and Boulder, started to engage the logistics necessary for such a visit. There was no response to the invitation for a few months. After a while, people began to lose heart in the project, thinking that Trungpa Rinpoche must not be interested enough even to respond. Then, out of the blue, a response did come. In the interim, Trungpa Rinpoche and his wife Diana had come first to Canada, then to Vermont, where Trungpa Rinpoche was offered land to start a meditation center, to become Tail of the Tiger, then later, Karme Choling. To the surprise of the people in Boulder, Trungpa Rinpoche wrote that he would be coming for a much more extended time than was proposed. He also asked for $500 to get his wife and himself to Boulder. John Visvader and Karl Usow provided the funds, and Trungpa Rinpoche was on his way to Boulder. But first, he spent the summer at Karme Choling, and some time in Los Angeles, presenting talks, introducing meditation practice, and attracting new students. A couple of weeks before his arrival in Colorado, Trungpa Rinpoche sent two of his first American students, John Baker and Marvin Casper, whom he had met at Karme Choling, to Boulder with explicit instructions to dispel any preconceived notions of Trungpa Rinpoche as being an exotic spiritual being or pure monk. 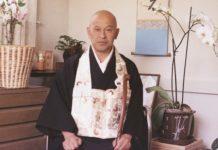 A meeting was called of all interested people, which by that time consisted of the original CU faculty and students, the Zen group, and a variety of American Hindus, Macrobiotic practitioners, Pygmies, and a few others. John and Marvin proceeded to report to the group that Trungpa Rinpoche drank alcohol, smoked cigarettes, engaged in sexual relations, and so on. Several of the attendees were repelled by these seeming contradictions to their own image of a “spiritual master” and took their leave after the meeting. The rest stayed on and began preparations for Trungpa Rinpoche’s arrival. 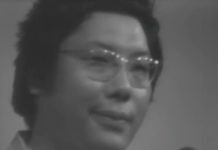 In the fall of 1970, Trungpa Rinpoche arrived at Stapleton Airport in Denver. A small cabin had been found available for rent, located at an altitude of about 9,000 feet in the mountains above Boulder. It stood in an alpine meadow with a clear view to the snow peaks of the Front Range of Colorado. It had no running water or indoor plumbing, and was heated with a wood stove. There was a notion that this would be perfect for Trungpa Rinpoche, a retreat remote from the activities of a town, pristine and natural, and a place where his students could then gather around for teachings and meditation. When Trungpa Rinpoche arrived in Colorado, he did indeed stay at the cabin for a week or so. But it was clear that he would need a much more convenient and modern living situation. He had been severely injured in an automobile accident the year before, and walked only with great effort and usually with help from others. It also became swiftly apparent that his intent in coming to Colorado to teach was not couched in a model of retreat and separation from mainstream society. A house in Four Mile Canyon outside Boulder was found, Trungpa Rinpoche moved into it, and soon he was joined by his wife Diana. 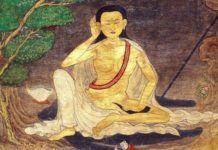 The first task he undertook upon entering the house was to mount a large thangka, a Tibetan religious painted scroll, of the Buddha Amitayus, a gift to him from the Queen Mother of Bhutan, on the wall of the living room and set up the living room as a shrine. This became the first center of teaching, meditation, and social activity for his budding community in Boulder. Meanwhile, John Visvader and Karl Usow were seeking possibilities for Trungpa Rinpoche to earn a livelihood. They approached the CU Extended Studies office and were able to schedule the first of several classes to be taught by Trungpa Rinpoche in the years to come. The first class convened that fall, held in the basement of the Hellems Arts and Sciences building and attended by twenty to thirty students. Trungpa Rinpoche’s new Buddhist students in Boulder were asked to limit their attendance to one class, so as to honor the enrolled students. Meanwhile Trungpa Rinpoche started to teach to his new community of Buddhist students in Boulder and around the country. 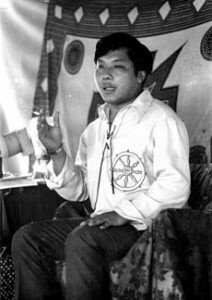 Trungpa Rinpoche taught a number of classes on Tibetan Buddhism at CU between 1971 and 1974, which were recorded and are available to listen to through the Naropa University library and also in the Shambhala Archives. The existence of these taped classes was corroborated by Judith Lief as well as the Naropa University Archives Librarian and Carolyn Gimian of the Trungpa Rinpoche Legacy project. 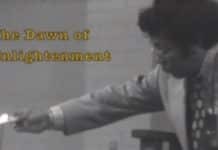 In addition to these early classes, one seminar is recorded as having occurred at CU in 1978, titled the “Open Secret” Seminar and consisting of 3 talks. This seminar also exists in the Naropa University Library and the Shambhala Archives. 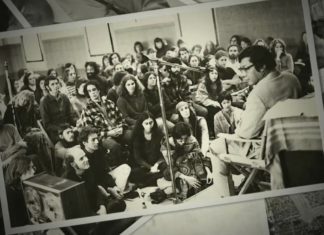 Following 1974, for the most part Trungpa Rinpoche stopped teaching classes at CU. Dr. Reginald Ray, a buddhist Studies scholar and student of Trungpa Rinpoche, was then hired by CU to teach Tibetan Buddhism. Dr. Ray was also involved in the founding of the Naropa Institute at the time, and was to become the Director of Religious Studies at Naropa, a position he filled for many years henceforth.